Spend a lazy day by the pool and recharge for a new adventure. Multiple championship courses are so close, you can be teeing off in minutes. The main pool is perfect. And the splash zone wading pool keeps the little ones happy way past nap time. Whether it's a frozen entree you microwave, or a homemade family recipe you spent the afternoon on - you'll have room around the table for everyone. Little ones will love the splash zone. You're also 15 minutes away from Disney's Animal Kingdom. Championship courses are just minutes away. Enjoy the fresh air without leaving your room - all residences have private balconies. Tuscana Resort Orlando is a Mediterranean-style villa resort located in the ChampionsGate golf community. Once you’re settled in your villa, get changed into swimsuits, grab goggles and pool toys and slather everyone head to toe in sunblock. Go for a refreshing dip in the oversized heated pool or hang in a poolside shaded cabana or lounger and keep an eye on the little ones while they’re having a blast in the kiddie pool and splash zone. They’ll be in the water so long that you’ll start to wonder if they’re part fish. Order lunch and a tropical drink from the poolside bar and restaurant. There’s an onsite 30-person movie theatre, perfect for escaping the Florida heat for a couple of hours. Get in touch with your inner-American Idol during karaoke nights. One- to three-bedroom villas sleep four to eight guests. Tuscana resort condos include fully equipped kitchens, allowing you to save money by making your own meals. Bring the kids along to Publix to stock up on groceries. Up for a low-key night in? TVs with Cable and DVD players have you covered. Bring favorite movies from home, pop some popcorn and call everyone into the living room for family movie night. The in-suite washer/dryer will allow you pack light (plus you’ll have more space for souvenirs – score!) I haven’t even told you the best part of all! There’s no need to leave your four-legged family member behind, Tuscana is a pet friendly resort. 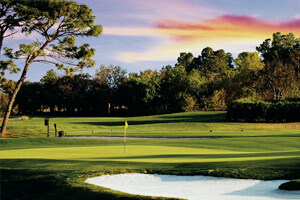 ChampionsGate Golf Course is just over a mile away from the resort. Gather all of the golfers in your crew and get ready for a little friendly competition. Walt Disney World’s® four theme parks and two water parks are less than twelve miles from Tuscana Resort Orlando. Be sure to check out Pandora – The World of Avatar® (new as of May 2017) at Disney’s Animal Kingdom®. Shopaholics, rejoice! Disney Springs features several shopping options (those souvenirs won’t buy themselves!) First things first: get your espresso on at Starbucks, there are two locations at Disney Springs. Now that you’ve had your caffeine fix, head to World of Disney®. It’s the world’s largest Disney character store and features everything from apparel, stuffed animals, accessories and home decor. When it comes to high-end shopping, stop by Kate Spade, Pandora Jewelry or Tommy Bahama. Hungry? Check out one of the many restaurants at Disney Springs. Universal Studios® features two theme parks and a water park. Hop aboard the Hogwarts Express and experience The Wizarding World of Harry Potter®. Go for a ride on a flying bike in the E.T. Adventure. Experience what it’s like to be a minion on Despicable Me: Minion Mayhem. Cool off at Universal’s Volcano Bay water park (new as of May 2017). - Front desk is open 7:00 AM-11:00 PM daily. Guests that are planning to arrive after hours can pick up keys from a security office located at the gate. For more details please contact the property using information on the booking confirmation. - Guests are charged USD 300.00 refundable deposit or have an option to pay a one-time non-refundable USD 39.00 fee.